The black walnut tree (Juglans nigra L.) produces a substance called juglone that is harmful to certain species of plants and trees. Plants sensitive to juglone suffer from wilting, yellowing, stunted growth and eventual death when planted within the 50- to 80-foot root zone of the tree, according to University of Wisconsin Extension. There are a number of plants that have a high tolerance for juglone, enabling them to survive when planted near the black walnut. Planting a garden near a black walnut tree is possible if you select plants that are highly resistant to the chemical juglone. Squash, carrots, beets and sweet corn all thrive when planted in gardens located near black walnut trees. According to Purdue University Cooperative Extension, bean plants, including lima and snap, onions, and parsnips suffer no ill-effects from exposure to juglone and will produce a successful and healthy crop while growing in the proximity of the black walnut tree. Melons, black raspberry bushes and wild grapes are not sensitive to juglone and flourish when planted close to black walnut trees. Placing trees and shrubs near the black walnut is successfully done by choosing varieties that are resistant to the chemical juglone. Crabapple, cherry, elm, locust and maple trees will grow alongside the black walnut. The University of Wisconsin states that Canadian hemlock, black locust and pagoda dogwood trees are all highly tolerant of juglone and will suffer no harmful effects when planted close to the black walnut tree, says . Azalea, mountain laurel, burning bush and rose-of-sharon are shrubs that flourish when planted within the toxic radius of the black walnut's root zone. Annual flowers highly tolerant of juglone include pansies, impatiens, begonias, zinnias, morning glory and pot marigolds. Perennials such as hollyhock, daylilly, hosta, bee balm and horned violets are resistant to juglone and flourish in flower beds or gardens that are in close proximity to the tree's root zone. Darwin tulips, daffodil, hyacinthus and crocus bulbs are not sensitive to juglone and have been observed growing under, or in areas close to, the black walnut, says Ohio University Extension. Certain field crops are highly resistant to juglone and will survive when planted near or under a black walnut tree. White clover, soybeans, wheat and timothy exhibit no reaction to the chemical juglone when planted around black walnut trees, according to University of Wisconsin Extension. Red top grass and orchard grass flourish when placed within 50 feet of the black walnut tree. Kentucky blue grass and fescue are also known to be highly tolerant of juglone and will grow around black walnut trees as well. 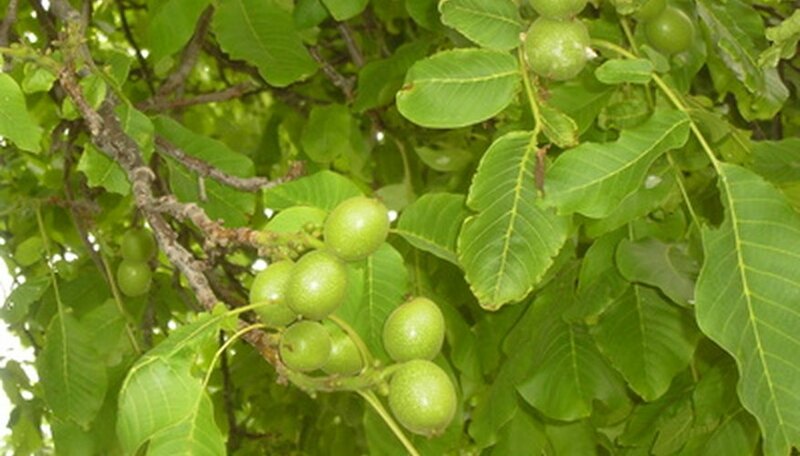 Which Vegetables Can Be Planted Near a Black Walnut Tree? What Trees to Grow Near Black Walnuts?